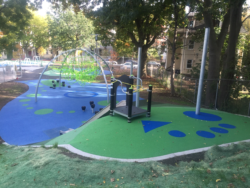 A growing number of schools, playgrounds, and parks with play areas are looking into the application of poured-in-place rubber surfacing also known as PIP Rubber. There are numerous benefits for this product, including appearance, safety, and ease of upkeep. 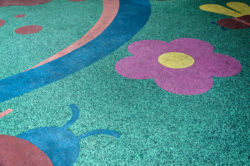 Are you looking for information about PIP rubber surfacing in Chicago? If you need a safe and attractive playground surface in your community, Pro-Techs Surfacing, LLC offers the highest quality and trusted rubber surfacing solutions. Our company offers several products which we install in Chicago and elsewhere throughout the country. Perma Play is a poured-in-place product which is attractive and durable. The surface is also clean, reliable and resilient. A fall on this surface is less likely to cause serious injury to a child. We are a one-stop shop for everything you need to install a playground surface which will stand the test of time. Since 2010, we have been offering the highest quality solutions, Our portfolio currently includes the installation of more than two million square feet of safety surfaces and recreational spaces. We have completed projects of the most basic nature, as well as those with complex graphic designs. We skillfully handle everything from providing a quote to completion of the process. 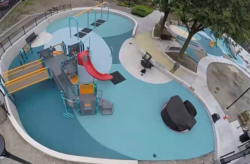 We provide efficient installation of our products, but we also offer our skills to do inspections of your playground surfaces to be certain that they meet the necessary standards for safety and quality. If your surfaces need care and maintenance, we also offer a professional team to respond to those needs. Both indoor and outdoor play areas are included in the list of our completed projects. Our products are IPEMA certified and made with the finest raw materials available. We have a long list of happy clients across the nation. They included municipal engineers, landscape architects, and Parks & Recreation Departments. When you are considering a daycare facility, you need to think about the safety and comfort of the children in your care. We also have installed PIP rubber for school districts, churches, military, and many other organizations. There are several types of products, ranging from Perma Play to Perma Mulch to Perma Turf. Each of these products is suited for a particular look and purpose. 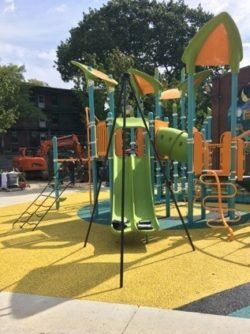 Pro-Techs Surffacing, LLC offers expert design, build and installation services related to rubber playground surfacing in Chicago. No job is too large or too small for us to handle. One of our customer service representatives will be happy to discuss your options. To learn more, call 330-576-6058 today for a free no hassle quote!